I have a little 'thing' for bottles and glassware lately. 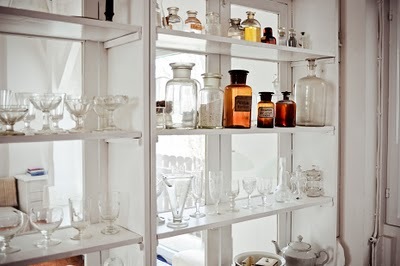 I have collected far more cloches than I need and antique apothecary bottles seem to call my name. anyone else sharing this obsession...? I love the ease & simplicity of your blog. Keep up the good work! We have been noticing apothecary bottles more and more lately. Cloches have been our obession for a while as well. 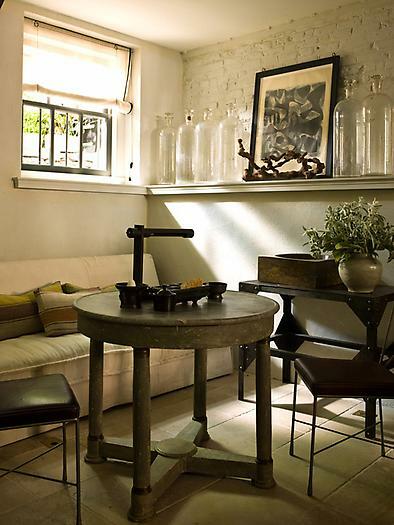 These images are great examples of how beautifully apothecary bottles can be displayed. Donna I love these collections. Would you believe I do not have a Cloche yet! I mean who doesn't have a cloche! I have to admit I am editing out at my home! Most end up as lovely vessels for my cross and sea life bottles, but there are always those bottles that I fall in love with as is and they mysteriously leave the studio and grace my windows, mantle, bookcases and counters at home! yes! I have a collection of little shells in a few on my bookselves in my living room... bath salts in a few in my bathroom and even powdered laundry soap in one in my laundry room...love them! So pretty! I have not caught this bug yet... but I can feel it starting to set in thanks to these photos. These are so pretty http://www.restorationhardware.com/catalog/product/product.jsp?productId=prod1618003&categoryId=cat780015 but I have enough self control to resist them. If I ran into some at an antique store? I'd totally fall off the wagon. Such cool collections. You always showcase the most beautiful objects. yes, I have quite a few... in my garage. I know awful. Just havent been able to find a good way to display them in my home. boo. I will join you at a meeting;) Yes, I have a bit of a "thing" too! I have several sets of dishes (but not a dishaholic- I'm a white plate girl at heart), but glasses- oy! I am obsessed. I've been finding some antique pieces lately that I just can not leave behind;) Also love the large glass bottles of all shapes and sizes! Love the post! It would be interesting to think of the psychology behind the collecting! YES! I have many old bottles. Also I have a bottle tree. And cloches are wonderful... an object takes on a whole different aura when placed under a cloche, n'est-ce pas? I love 'em too. I can't keep them in stock in the shoppe-soon as I bring them in, they're flying out the door. ummmm. can you say over 100 nuts? I absolutely love them. I did a post a while ago about ideas on how to use them in design if you want to take a look! these aren't antique but I still love the look...also have some vintage ones from our great flea market here in Munich, so yes, I'm definitely hooked!